Do you believe in angels? What are they really? Will we ever know? Lots of questions and lots of times when we can actually feel the presence of an angel, if we are aware! Angel means messenger, it comes from angelos, the Greek for messenger. And the third Order Principalities, Archangels and Angels. Angels are active and are powerful heavenly beings whose presence is not only an assurance of God’s activity in the world but also a guarantee of the eventual aid to faithful people. Gentle and brave, gallant and bold. Michaelmass, the season when the summer is coming to an end, a time when the beautiful warm weather starts to become a little cooler and the autumn approaches. September 21st is also the time when the sun is at the autumn equinox and directly overhead at the tropics, the time of spring tides and full moon. Michaelmass was the time in the agricultural world when the summer seasonal work was at a close and those working on the land over just the summer seasons would be looking for work elsewhere for the sinter season. A time for change. In Thomas Hardy novels he makes full use of the season to show a whole army of characters with their agricultural implements and particular skills in field work to be present at a market of fair in the local towns. Today,September 29th is the day of Michaelmass, which is why I thought it would be so nice to have the service here again at All Saints Ashwicken. The original day of course when a mass was held for St Michael. Before we get to Michael, let’s think about angels. The strange thing about angels is that they are often in church, as wooden angels in the roof or in other places, but it is seldom that we talk about angels. Outside the church, it’s different, people often talk about angels, guardian angels, messengers, spiritual beings, moving from one place to the next, moving from heaven to earth. 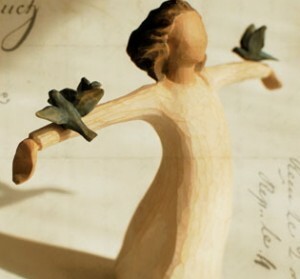 For many people, searching for some signs of spirituality the concept of angels is a real help. They are visible, in the form that we imagine them in, whereas God is very hard to imagine in any visual sense. They also seem to be with us on some occasions. Maybe it’s also a way for people to reach towards God in some more realistic way. I think if you have faith, it’s a hard concept, just to visualize the angels and then never to move on from that. In the Bible there are many references to angels, one of which being in Genesis, ch 28,v 10 14. Jacob’s dream of the ladder to heaven with the angels going up and down between heaven and earth. 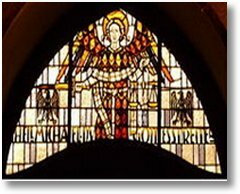 In the third order we find Archangels, of which there are four (or seven), Gabriel, Michael, Uriel and Raphael..
Michael is seen as the chief of archangels, a defender, guardian, protector of Israel. He is shown in Daniel as a warrior and of course in Revelation he is the slayer of the dragon and also the angel who cast out the Satan from the heavenly thrones. Who prowl about the world seeking the ruins of souls. In the pictures we have from artists, Michael is shown as a soldier, crusader, often with wings, with a shield and a spear. He is said to have come to Joan of Arc in 1412 as she was caught wearing men’s clothes and having joined the army, and then later burnt at the stake as a heretic. Michael was there with her. There are 2 places immediately to mind to show Michael as a protector of places, Mont St Michel and St Michaels Mount in Cornwall, I’m sure there are many more. In my reading for tonight, I came across the following theory, which greatly appealed to me. The whole point of celestial hierarchies is to be inclusive and to give a place for all angels. St Michael is believed to be the chief of archangels, but this would out him even above the seraphs and this was not fair, so he is included in the archangels and therefore with the third order of all angels. Anyway, getting back to earth for a moment, tonight we share in the celebration of St Michael and All Angels, in the tradition of Michaelmass and to be present in this church as people gathered together in God’s name. We cannot know all about angels, there are vast books written on the subject, I collected several from the Cathedral library last week, which have helped me tonight. Some people think its just fantasy, an unreality,this whole idea of a ladder to heaven, angels wandering around the earth. But just sometimes, don’t even the most skeptical of us, have times when we feel truly blessed, a small miracle happens, or we just become aware of a helping hand. But just sometimes isn’t there a time when we need a little help, we try hard ourselves but life is tough at times, just the times when we do need an angel.